Australia’s Prime Minister Julia Gillard is feisty and personable in debate, and comfortable and easy at walk-arounds, but in interviews and speeches she is criticised for having little animation and a nasal monotone that can sound flat and stilted. 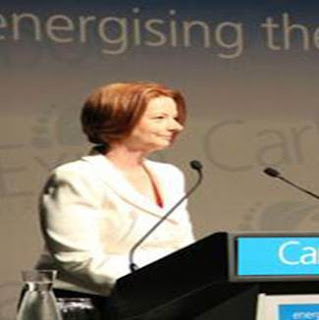 Her address to the Gallipoli Dawn Service this year on ANZAC Day was a challenge she met well. ANZAC Day (April 25th), commemorates Australians at war. It’s a significant holiday, and Dawn Services are held throughout the country and overseas to mark the anniversary of the first major military action fought by Australian and New Zealand forces, at Gallipoli in Turkey in 1915. The battle was a devastating defeat, but it was the coming-of-age for these two young countries, and gave birth to the ANZAC legend – the national character. So it's a national occasion in an international arena, and she’s speaking because she's Head of State. Apart from the normal challenges that go with this, consider what else she was up against. First there’s the setting. She is speaking outdoors to a big crowd in cold pre-dawn darkness. Second there’s her gender, a female leader memorialising a very masculine military event. Third we have the political context. She’s delivering this speech just days after announcing Australia is reducing its commitment in Afghanistan, amid widespread criticism at home about the effects of war on veterans and their families. Finally there’s the emotion. Any ANZAC speech is freighted with generations of symbolism, tragedy, grief and loss. The theme is always “ Was it worth it?”, there can be no other. “They were strangers in a strange land. Men who came from “the ends of the earth” in an enterprise of hope to end a far-off, dreadful war. “…did not begrudge the victory of their enemy, which was hard-fought and deserved. The speech builds to a climax that could have been corny (because of the way it plays with place names), but instead it is heartbreaking. “In this place, they taught us to regard Australia and nowhere else as home. These are unusual speaking circumstances, but there are still some lessons to be learned. Honour the occasion. A dignitary at a ceremonial event has little control or flexibility over format, timing, or even content. These are all largely pre-ordained. To present well at these events you should be sure you’ll meet the expectations of the organisers and those attending. Understand what it is they want from you. Formality and state occasions invite big messages, simply stated; rousing, direct language; and strong (but contained) emotion. Manage the feelings, don’t avoid them. An occasion like this is necessarily sad. This speech has enough feeling to carry the mood and no more. Gillard keeps up the pace. She doesn’t hurry – far from it, but while the words are emotive, her naturally flat delivery sounds matter of fact. This steers her away from sentiment and into practicality. Her tone lacks light and shade or dramatic effect, which gives her a no-nonsense touch. It’s moving but not mawkish. Keep eye contact. It would be better if Gillard raised her eyes at the end of her paragraphs. She could hold our attention but instead she disconnects from us while she finds her next line. It’s an elementary mistake (perhaps there’s no autocue), but however much you want to look away and hide from the audience remember, you may not. Dress for the podium. I wish it wasn't so, but female speakers are invariably assessed on how they look as well as what they say. I don’t much like that hat and coat combo. The downward brim draws attention away from her eyes (which are what we want to see), and the collar and hat together clutter up the silhouette - but of course it’s better than freezing or having her hair blowing in the breeze. I'd have preferred a hat that showed her face in full. If you are dressing to look good from a distance, keep the outline tailored and uncomplicated. To see the video of the speech, go here.